6x9 Hardcover 242pp Autographed Copies Available! When Bill Snyder arrived as head football coach at Kansas State University prior to the 1989 season, he inherited the worst NCAA Division I football program on planet Earth. In 93 previous seasons, the Wildcat football record was a miserable 299-510-40. The program had earned exactly one league title, that coming in 1934, well before Snyder was born. In the years just prior to Snyder's arrival, the Wildcats had slumped to their worst, even by K-State standards. The program had lost 13 games in a row, and except for one tie, and had not rung the victory bell in 27 games. Seventeen years later, Snyder's orchestration of the greatest turnaround in college football history defines the American dream of achieving the unimaginable. 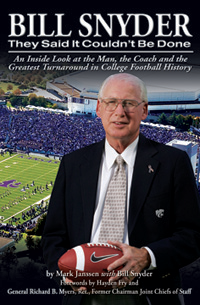 This is his story, from Bill Snyder's unique viewpoint, of the process by which he helped transform a program considered the laughingstock of college football into one that won 136 games over seventeen years including eleven bowl appearances and seven seasons of at least ten wins and became a household name in college football circles. It's also the story of Snyder's own triumphant journey, one that forced him at a young age to deal with his own lack of discipline and academic shortcomings in a single-parent family, one that saw him climb to the top of big-time college football, and one that ultimately brought him face-to-face with the toughest decision of his life. Snyder's story is written by Mark Janssen, sports editor of the The Manhattan Mercury since 1981 and a fixture of Kansas State athletics for the better part of four decades. It captures, in Snyder's candid, upfront style, the action behind the scenes in running a major college football program, the strategies employed by early K-State coaches to change the culture of losing that had permeated an entire university, and the magic with which Snyder pulled off the Miracle in Manhattan.